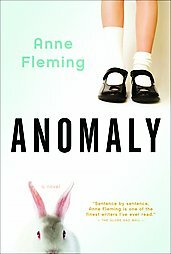 Anne Fleming’s Anomaly (2005) is one of those novels, which, despite being nearly five hundred pages long, makes you want to return right to the first page and begin again once you’ve finished reading it. It’s the kind of book that leaves an empty spot somewhere inside your chest or stomach when you suddenly realize your sojourn in its world is done. Despite having spent so much time with them, I wasn’t ready to leave the characters, desperately thinking when I closed the book: ‘But, but, what happened to that character? What was this character’s reaction to her daughter’s revelation? Does this character change her mind about dating the other character? What does the future hold for them? ?” Like all great books, Anomaly leaves the reader wanting more. The novel is fundamentally a story about growing up. In fact, it’s a tale of two seemingly average girls: two sisters, a mere year and a half apart, who live with their middle-class family in Toronto, in the 70s and early 80s. Carol and Glynnis, however, are anything but average: the official anomaly in their family is Carol, who is an albino. In elementary school, Glynnis, her younger and much more popular sister, actually brings Carol to school for show and tell, only dimly aware of why this is quite an awful thing to do to her poor sister. Glynnis, however, soon joins Carol in the ranks of outsiderdom: one day at Brownies, a horrific accident—for which Carol is to blame—results in her sister’s permanent disability. The repercussions of this event echo throughout the novel, well into the teens of each girl: at sixteen, Glynnis allows her friend to make a documentary titled A Day in the Life of a Teenage Cripple; at seventeen, Carol tells her boyfriend that she’s been known as a killer since age eight. Although there are two men in their family—Carol and Glynnis have an older brother and their father is relatively present—Fleming never gives us the direct perspective of any man, instead choosing to focus on Glynnis, Carol, their mother Rowena, and Rowena’s older friend Miss Balls, who functions as a kind of grandmother figure for Carol and Glynnis. I found this to be a moving feminist strategy, giving voice to these diverse but everyday women. Fleming has an astonishing talent for entering the minds of her characters, no matter how different from each other. She’s equally comfortable showing us the inner workings of the aging Miss Balls, still living out her days as a nurse in the first world war, and seventeen-year-old Carol when she enters her punk phase in 1982. Although not narrated from a first person point of view, each section takes on the voice of whichever character Fleming is concentrating on. Let me focus for a bit on the queerness in the novel; there’s two very different kinds, in fact. You see, Miss Balls—Beryl—had a very close relationship with a fellow nurse, Miss Boothson—Bootsie, for short—while they were serving together in the first world war. Fleming describes Beryl’s feelings for her friend: “There was something about her—beyond the quick likability that attracted everyone—that Beryl was drawn to and a little in awe of. Warmth was the chief offshoot of it, but it was not the main thing. The main thing Beryl could not for the moment identify. She only knew she would always want to be close to it.” Beryl, however, is not ever able to fully recognize what to the reader is clearly love. It’s a painful but beautiful story. [Glynnis] did not go straight to band but into the washroom, where she sat on a toilet seat and lightly banged her head on the side of the stall. Fu-uck. She had a crush on [her]. It was obvious. It was pathetic. She felt vaguely sick. How had this happened? Her stomach floated balloonlike in her belly, her cheeks were hot. In grade eight she and Tamara had entertained themselves with preteen advice books from the library. “A crush on older girls or women is normal and nothing to worry about. Before you can say ‘I adore my camp counselor’ you will grow out of it and find your crushes placed firmly on ‘dreamy’ boys.” But Glynnis would not grow out of this because she had never grown into it, it had always been there. Alongside, it’s true, crushes on boys. But those were different crushes, the ones on boys. Social crushes. I-know-you-like-me-so-why-won’t-you-ask-me-out crushes. You-fit-my-conception-of-social-worth crushes. This was a heart-thumping, tongue-tying crush precisely like every puppy-love gush story she’d ever pretended not to read in the corner of the library. [She] was leaning against the next locker. Her pea jacket was open, her arms were folded across her chest, her feet in their perfect-shade-of-tan Grebs were crossed, her faded jeans hung low in front, higher in back. She wore a Cowichan toque. Glynnis had never before been aware of such perfection in a human being, not in the clothes themselves, but in the wearing of them, in the pose, in the skin they covered, the muscle and bone the skin covered, the heart beneath it all that pumped. Fleming manages to brilliantly strike a balance between ruthless honesty about and affectionate generosity towards her characters. You see clearly the mistakes and flaws of each character: but you also can’t help but love them. You, of course, feel sorry for Carol, the kind of kid who just isn’t cool, who’s trying too hard, who has ‘love me’ desperately written across her forehead. But you also sympathize with Glynnis, who rolls her eyes at Carol’s attempts to make people like her and is frustrated that Carol hasn’t learned how to milk her difference. When Carol much later finally sheds her self-consciousness performing her song “Hello there, Death” with her punk band, you are right there with Glynnis cheering her on. You understand why Miss Balls lives in the past, never having recovered from the death of the woman she never admitted she loved, but you cringe when she’s reprimanded for calling some young Black girls under her care in Girl Guides pickaninnies. What’s worse, she doesn’t even understand what the problem is. What century is she living in, honestly? In fact, as epitomized in the ‘pickaninnies’ scene, the novel is often both painful and funny at the same time. It’s also poignant, ruthless, and unbearably real. I loved it. Along with Bottle Rocket Hearts, it’s one of the new books I’ve read this summer that has firmly earned a space on my shelf of all-time favourites. 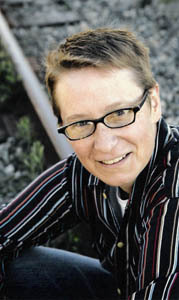 This entry was posted in Anne Fleming, Canadian, Coming-of-age, Fiction, Lesbian, Queer, Toronto and tagged books, Disability, literature, raincoast books. Bookmark the permalink.